Dray takes the initiative to alert two people who are each emitting a 'high' diabetic scent in the same room, which is the scent they are working with to train both dogs during this particular session. The scent could be very easily substituted for any other scent, and the learned behavior to alert would immediately be applied to the new scent introduced. This is how a dog can be used for search and rescue, he's just given the new scent of an individual, and asked to find it. The behavior is already learned. It's important to keep in mind that even though a Service Dog can detect a scent, most human olfactory systems may not detect it. This gives the sufferer a window of opportunity to have control over the situation, to make the necessary decisions, and take measures to control the odor to avoid embarrassing social situation. 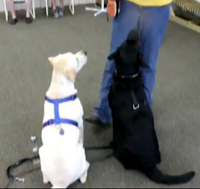 A Service Dog's olfactory system can answer so many questions. He could help us classify the various odor types to begin with.